Common Mistake To Avoid – Is The Customer Always Right? I realize that PMI’s 2019 National Conference isn’t until October. Theoretically none of you will be forced to defend your home state until then. Unless you’re working on virtual teams, whereupon you might well be asked your opinion about the click-bait thrown at you by a Microsoft browser. These hacks are citing the 2018 National Movers Study. The data is collected annually by United Van Lines, the nation’s largest household goods mover, according to their press release. There are interesting insights in this data – and we’ll get to that in a bit. Second, the good news: Three counties in NJ made MSN Money’s list of MSN Money compared counties using American Community Survey data (from the Census Bureau) to rank the 25 best US Counties in which to live. Judges were looking for places where one’s neighbors would be uniformly healthy, wealthy and wise. The article placed Somerset County at #15, Morris County at #16 and Hunterdon Count at #17. Colorado had more counties listed (including the #1 spot) and California also had three counties listed. New Jersey, a smaller state, can feel pride of place. Back to topping the list of net exits in percentage terms. 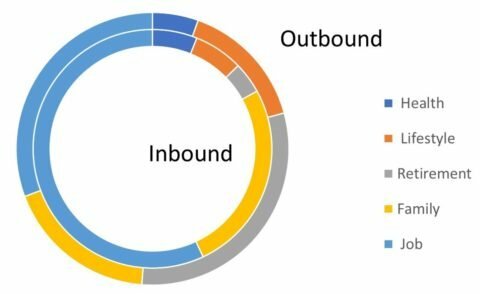 The actual difference between outbound and inbound moves is 1,488 households. We do not know family size, though we can assume that the total number is 3,000 or more. In a state of 9-million people, the net loss of a few thousand people is a small percentage. The same study showed New York experienced a net loss of 1,784 household units. Connecticut, a small state, was down 830 net; Massachusetts lost-on-net 567; Michigan lost-on-net 508. Illinois and California had a greater exodus. Then again, like New York, those are much more populous states than NJ. To provide a sense of perspective, the Morris County Economic Development Corporation plotted the household shipments in and outbound in states with a similar population to New Jersey. It’s true that New Jersey does have the greatest percentage difference between inbound and outbound, but not the numbers themselves. Without explaining that, CNBC goes onto say that the top reason residents left was for a professional opportunity, i.e. listing "job" as the deciding factor. What was left unsaid, is that "job" is the primary reason that people came into the state as well. See chart below. On the doughnut chart, the inner ring shows the relative percentages of those moving into the state. [That is, the households using United Van Lines for the move in.] This can be compared with the outer ring which shows the relative percentages of those moving out of the state. The data also tells us that New Jersians either stay put or move themselves across state lines. The traffic in / out of NJ is modest compared to other states. One might also guess that, because we are an immigrant-friendly state, many households pack the car or rent a truck to move in. When they gain enough wealth, they can afford to hire someone to move them out. If there’s an outflow of wealth from this state because that's why people came here. Yet according to the United Van Lines data, the affluent move in and out of NJ at the same rate. Apparently, the system is working. Common Mistakes To Avoid – Is The Customer Always Right? Your major stakeholder asks that you provide a project plan tomorrow. You are working on 10,000 other things. However, you promise the stakeholder you’ll provide it tomorrow. Next week comes, and, unfortunately you didn’t have enough time to complete a plan. You are following the model that the customer is always right. So you send an overall high level plan, some sub-tasks, without any dates. Once you meet with the stakeholder, you’ll provide more dates and add sub-tasks. The next day your boss calls you. That same high-level stakeholder complained to your boss because you didn’t have dates and sub-tasks. Providing a plan that is incomplete without knowing the temperament of your stakeholder is not wise. Even though the stakeholder requested the project plan, don’t provide a high level plan until you have ample time to complete it. Then review it by yourself. Than review it again for any errors, such as inconsistent dates, misspellings, and other document distractors. After you’ve done that send the project plan along with a calendar invitation to review the plan with your manager. Have you seen mistakes that a Project Managers make? If so, please contact Igor and it might appear in the next article so that we can all learn from the experience.